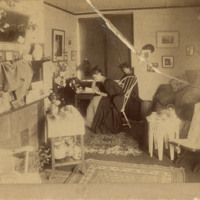 Picture of Emma Doll Bailey and her friend Abby S. Brayton, Bryn Mawr class of 1924, "studying" in 28 Denbigh Hall. This image was a study that was later used for a sketch. 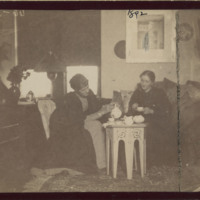 A photograph of Emma Doll Bailey and friend, Abby S. Brayton, Bryn Mawr class of 1894 (married names Emma Bailey Speer and Abby Brayton Durfee) at tea in Denbigh. 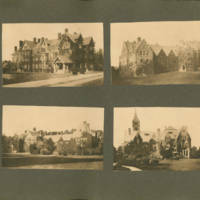 Taken in 1892. 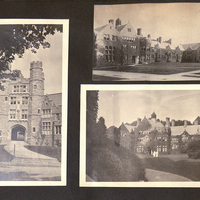 From the photo album of Margaret Bailey Speer (daughter of Emma Doll Bailey), Bryn Mawr College class of 1922.